Jul. 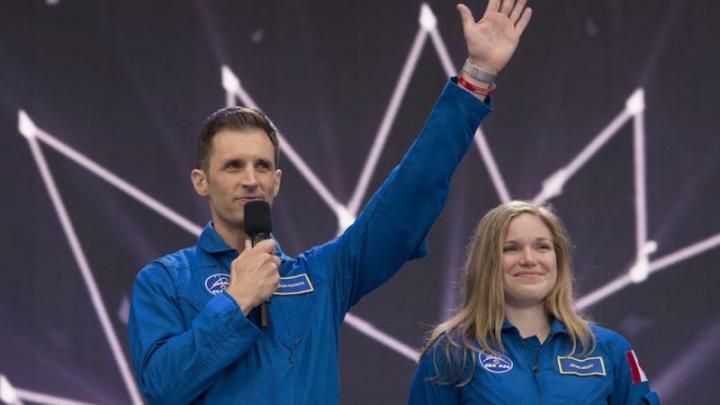 1, 2017 6:20 p.m.
Two Albertans were named Canada’s newest astronauts Saturday as the country marked its 150th birthday. Prime Minister Justin Trudeau used the platform of waterlogged Canada Day celebrations in Ottawa to name Jennifer Sidey of Calgary and Joshua Kutryk of Fort Saskatchewan, Alta. Sidey is a lecturer with the University of Cambridge who has worked as a mechanical engineer, while Kutryk is an air force pilot who also holds a bachelor’s degree in mechanical engineering and a master’s degree in defence studies. Sidey told the crowd she was inspired to become an astronaut in 1992 when Roberta Bondar went into space aboard the space shuttle Discovery. She said she had the opportunity to attend a speech in Calgary by Canada’s first female astronaut. “I remember looking up to her being excited at the idea of being a scientist, being a Canadian and having the opportunity to explore places beyond our world,” she said. Kutryk, who holds the rank of lieutenant-colonel in the air force, said he is honoured to be joining the Canadian Space Agency. “Throughout the recruitment campaign, Jenny and I met some amazing Canadians, scientists, doctors, engineers, pilots like myself. There is so much talent in this country,” he said. Kutryk, 35, was fascinated with space as a child, according to a biography posted on the Canadian Space Agency website. He said he knew his life would focus on helping to explore it. “I have always wanted to leave the world a better place than I found it, and I believe that space is one area where I can do so, Kutryk said in a question and answer on the space agency’s website. Sidey, who will be 29 in August, said her motto is “fortune favours the brave.” She said her greatest previous achievement was to become a lecturer at Cambridge, something she never dreamed of when she first moved to Britain in 2011 as a engineering graduate. Sidey and Kutryk will move to Houston this month to start the two year training program for astronaut candidates. The program provides instruction in the systems on board the International Space Station and a host of other things ranging from spacewalks to survival training to Russian language instruction. The two astronauts will be officially welcomed Tuesday at Canadian Space Agency headquarters in Quebec.